Anyone interested in the security of our nation should spend twenty-two minutes watching this YouTube presentation. It’s excellent. Inadvertent leaks of sources and methods are bad. They are vile and beneath contempt when for political purposes. The Administration’s leaks could have had no non-political purpose. It is dynamite: the production values are excellent, and the message is overpowering. The video is 22 minutes long, but trust me: it is riveting, and goes fast. You should watch the whole thing, to appreciate how dishonorable the Obama administration is when it comes to national security. It should be watched to its conclusion. It will probably load more quickly if the “You Tube” icon at the bottom of the frame is clicked, rather than the white triangle at the center of the embedded version presented here. President Obama has neither worn a military uniform nor had any personal acquaintance with military intelligence gathering. He has no first hand knowledge of what our troops or intelligence operatives do or the prices they pay for doing it. I have no idea what he may have been thinking beyond personal political gain. Had he consulted any non-political advisor knowledgeable as to military intelligence and the national security implications of what he was about to do — about how difficult it is to get sources and how necessary it is to conceal their identities — even he might not have proceeded as he did. As it was, he apparently felt an overwhelming need to be portrayed as the strong leader he is not. In consequence, the Pakistani physician who revealed the location of Osama bin Laden is now rotting in a Pakistani jail for a term of more than three decades. Recruiting intelligence sources willing to take risks of such betrayal by the Commander in Chief or those working directly for him, in addition to the normal risks inherent in telling our intelligence people what they need to know, will be far more difficult than before. Our own operatives and their families have also been put in danger. In the situation he has created, would President Obama agree with this suggestion: “Please to walk in front, sir” when we next go into battle? Into a situation such as the killing of Osama bin Laden? I doubt it. There is hardly any excuse for such behavior by an Army private. For the Commander in Chief to engage in it for any purpose is inexcusable. For him to do it for his own political advantage is vile and beneath contempt. It’s comforting to learn that all necessary truth and wisdom can be found in one place, the Barack Obama Truth Team website, and that there is therefore no reason to look beyond it. The Truth Team piece has two links, both to a great bastion of fascinating objective reporting, Mother Jones. According to the article at the first link, the video originators used military logos without authorization. According to the article at the second link some of the video supporters, conservative miscreants, have opined that Islamists are dangerous. Both Mother Jones articles attack the originators of the video but don’t deal with its substance in any meaningful way. I won’t analyze them further here but instead suggest that anyone interested read them. The piece at the Obama Truth Team site restates some of the Mother Jones charges but provides no useful information about the matters raised in the video beyond characterizing it as rife with partisan, Swift Boat style falsehoods. It’s not enough to wish them away or dismiss them because they come in part from “birthers” who still won’t concede that President Obama was born here in the United States. No, we need to get moving now — before it’s too late. Throughout this campaign, Mitt Romney and his allies have shown that if the truth isn’t favorable to them, they have no problem claiming the opposite — and the reality is that President Obama has a foreign policy record that is among the strongest in recent memory. In 2008, then-Senator Obama said he’d end the war in Iraq in a responsible way and refocus on taking out Al Qaeda’s leaders. You and I know he’s followed through in a big way on both those promises. Thanks for fighting back — forewarned is forearmed! I completely agree that it’s “vile and beneath contempt” to purposely leak classified information, regardless of the motives of the leakers. To do it for political gain is just that much worse. It’s also a crime, and those who do it should be prosecuted. There’s no question that most liberals, particularly the “elites,” have little but disdain for the military and those who serve proudly without whining and crying about it. I’ve worked in combat with special operations forces, and I can attest to the fact that they’re the best of the best. That some political hack without military experience and little or no knowledge of the military, regardless of his or her seniority, would endanger both their missions and the operators themselves is disgusting. One point, though: You’ve taken Obama to task for authorizing the leaks, and if he did, everything you said is justified. But where’s the proof that he personally approved the leaks or knew about them beforehand? No matter how little you think of him, basic fairness requires that he be considered innocent until proven guilty. It’s fair to complain that the investigation into the leaks is being carried out by a couple of U.S. Attorneys who work for the AG. However, it’s not fair to make a leap to the guilt of the President before an investigation has been completed. Although President Obama does not have a “The Buck Stops Here” sign on his desk, the buck does have to stop there. That’s one of the burdens with which a conscientious and competent President has to accept and deal. There were pernicious leaks and if he was not personally involved he should have been able to prevent them. He did not. Instead, he gave folks in Hollywood access to important information concerning the killing of Osama bin Laden so that a motion picture favorable to himself could be prepared for release shortly before the November election. Fortunately, release has been postponed until December. The motion picture debacle is noted in the video, with a picture of President Obama personally briefing the motion picture people. 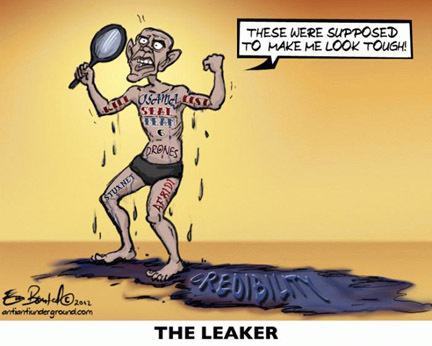 The support for the theses that President Obama either had a hand in the leaks or that as a minimum he could have prevented them had he been paying even a modicum of attention is substantial. I agree with your last paragraph — there is substantial reason to believe that Obama at least knew what was happening and who was doing it, at least after the fact. Since there are serious crimes involved, that doesn’t meet the standard to conclude that he’s guilty. A few more “ifs” are appropriate. Perhaps Romney will pardon Obama after he takes office, a la Ford and Nixon, regardless of what he may have done. There may or not have been criminal conduct. However, I do not think that whether there was criminal conduct is a useful question and I don’t much care what the answer may be if it is ever known. Rather, the important question is whether President Obama can be trusted to perform the duties of the office to which he was elected and to which he seeks reelection. Among those duties are the preservation and enhancement of national security. You say that you agree that “there is substantial reason to believe that Obama at least knew what was happening and who was doing it, at least after the fact. (Emphasis added. )” He may also have leaked or encouraged his subordinates to leak sensitive national security information. Those strike me valid issues that should be fully ventilated before the November election to the extent that national security is not likely to be endangered by doing so. If President Obama was himself complicit, or if he knew and did not act immediately and effectively to prevent further damage, there is no reason to assume that he would do better during a next term in office when he would have “increased flexibility” to do pretty much as, when and how he pleases. We may never know who did the leaking and what Obama knew or did about it, just like we may never know the F&F facts that Holder seems to be hiding. The best and quickest answer to all this is to elect Romney. I’m not so pollyannaish as to think Romney would be a perfect president. But things would change, I think probably in the right direction, and there would be more honesty and integrity at the top. One hopes, anyway…. I see that the letter is signed by the odious John Kerry, he with that night in Cambodia seared in his memory, faker of medals, protester extraordinaire, traitor who attempted to negotiate with the enemy during time of war, believer that only the stupid will end up fighting in the military, tax dodger, and serial gigolo. Surely they could have found someone with at least a little integrity to pen their response…. Am I to conclude that you think less than highly of Senator Kerry? Who, pray tell, “with at least a little integrity” could have penned such a persuasive response? Your conclusion is correct, sir. All politicians, with the possible exception of Alan Simpson, are liars and scoundrels to one extent or another. Even Romney, with his much-touted (and probably true) high character will say pretty much what he needs to in order to be elected. Kerry, however, is the rottenest apple at the bottom of a barrel with many somewhat less-rotten apples above him, so just about anyone else would do. Dan, good article, but discredited by the photo that leads it. The large cartoon that’s at the beginning of the article.